Ling Jihua is one of the biggest scalps in the country's unprecedented anti-corruption drive. Here's a look at the officials who were nabbed and the key graft fighters. Former position: Politburo Standing Committee member. The most senior Chinese politician ever convicted of corruption, Zhou and his family were found guilty of taking 129.7 million yuan (S$28.6 million) worth of bribes. 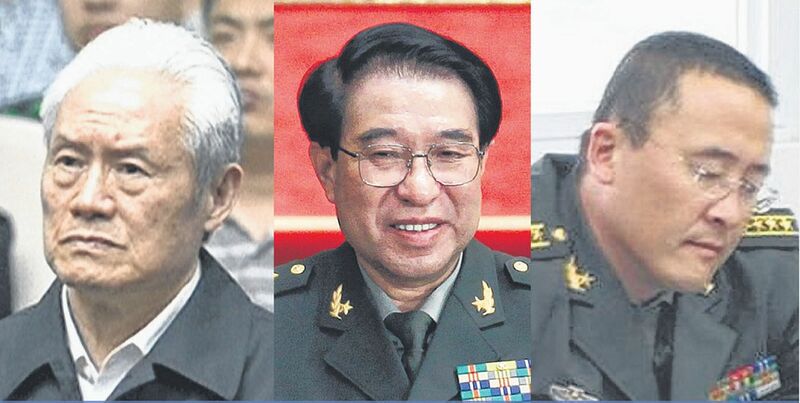 Graft Targets From left: Zhou Yongkang, Xu Caihou and Guo Zhenggang were caught in the anti-graft drive. Former positions: Central Military Commission vice-chairman and Politburo member. The highest-ranking People's Liberation Army (PLA) officer to be brought down for corruption, Xu confessed to taking bribes to aid promotions, but died of bladder cancer in March before his trial could start. Former position: Sinopec Group president. Wang allegedly awarded Sinopec contracts to his family and relatives and gave favours to Zhou Yongkang's son Zhou Bin over equipment sales. Former position: PLA Zhejiang deputy political commissar. Investigations into Guo, who was probed for corruption in March, fuelled speculation about the future of his father, senior retired PLA figure Guo Boxiong. Former position: Kunming party chief. Gao was suspected of paying bribes of several million yuan to Bai Enpei, a former party chief of Yunnan. Former position: Wenzhou deputy mayor. She is accused of embezzling 253 million yuan during her time overseeing construction projects as a deputy mayor in Wenzhou. Former position: Provincial financial bureau official . Accused of embezzling 94 million yuan over five years while serving as an official in Jiangxi province, he is believed to be the first Chinese fugitive returned by Singapore under China's current anti-graft campaign. Former position: Manager of state-owned water company. Anti-graft officials found 120 million yuan in cash in his home, as well as 37kg of gold and documents for 68 other houses. Former position: Senior National Energy Administration official. More than 200 million yuan in cash was found in his home, the biggest reported seizure of cash in the anti-graft campaign. Graft Fighters From left: CCDI officials Wang Qishan, Zhao Hongzhu and Huang Shuxian. Position:Central Commission of Discipline Inspection (CCDI) secretary. He is ranked sixth in China's leadership hierarchy, but is dubbed "the second most powerful man" in the country behind President Xi Jinping because of his anti-corruption portfolio and authority. He is a seasoned administrator with more than 30 years of experience in China's anti-graft agency at various levels. Made Minister of Supervision in 2013, he was in charge of CCDI's International Cooperation Bureau to hunt for overseas graft fugitives. Position: CCDI standing committee, Shanxi CCDI secretary. The top female graftbuster was sent from the central anti-graft agency to clean up Shanxi, one of China's most corrupt provinces. Position: CCDI standing committee, Tianjin CCDI secretary. He is believed to have been parachuted from the central government to Tianjin to block interference from local governments. Position: CCDI standing committee, Shanghai CCDI secretary. He is the first central CCDI leader to be parachuted to head a local anti-graft office, in Shanghai. Position: CCDI inspection team leader. He has made rounds of investigation in the provinces of Anhui, Ningxia and Qinghai, as well as the China Publishing Group. He was assigned to investigate China Southern Power Grid, one of the state-owned enterprises with the most number of officials hauled up for corruption. He is a veteran who did six rounds of inspections in different provinces and organisations under the current anti-corruption campaign. One of the younger team leaders trusted by the anti-graft chief Mr Wang , he had led investigations in Zhejiang.